I like to make this update on the first business day of each month but this month we’re a little late (no that does not mean that we’re pregnant) because we were traveling for the 4th of July weekend and my spreadsheet that tracks these numbers is on my work computer. But, the first day of the month is always a big day for me with my personal finance spreadsheets. While I update them nearly every day there are a few things that I do and track on a monthly basis, so the first day of a new month means that I get to hard code the actuals of the previous month and see how we did. I LOVE IT! So, how'd we do in June? I am a bit obsessive but I actually track my net worth every morning that I work, just because I love seeing the graph it makes and knowing what's going on, and it only takes me about 10 minutes using Personal Capital if I go slowly and analyze anything (if you’re not already using Personal Capital please click on the banner ad for them on the right of this article, they are 100% free and I love them and use their android app nearly every day). 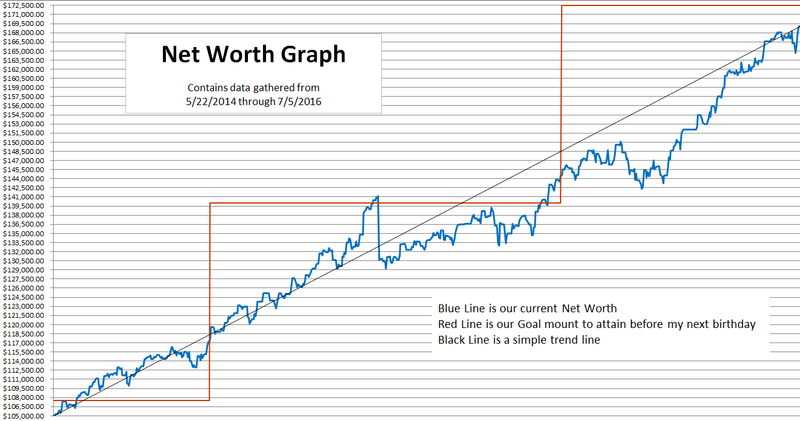 But over the past month our net worth has increased from $166,590.41 to $168,846.99, for a total gain of $2,256.58 for June. Only about half as much as last month but I’ll gladly take it since we had the Brexit scare and an unexpected $800 car repair. Another detail that I measure on a monthly basis is how much we've made (or lost) due solely to our investments. This helps me to see what I would have to live off if I didn't work at all and choose to live solely off of investments, which is the goal. The current amount needed from investments each month is $2,600, which means that at a 4% withdrawal rate we would need roughly $780k in investments (easy calculation: $2,600*12*25=$780,000). On the first of every month I document what all of our investments are worth and back out the beginning value of the previous month and all of the investments that we made during the month. In June we started with $99,103.55, invested $1,286.49 and ended the month with $100,759.10. Meaning that, in June, we gained $369.23 on our investments. So, for this month we would did not exceeded our monthly investment gains goal of $2,600, but we are also a long way away from the estimated $780k that we would need to sustain the $2,600 withdrawal rate. Now that we are halfway through the year we have seen an investment increase of 3.98% this year which is hopefully going to set us up for a solid 8% return this year. That would be awesome since my conservative models that I’ve built to project our future retirement date (December 10, 2033) assumes a 6% annual increase, so that extra 2% this year would be padding for future years when the market might drop some. I'm not going to go into the details behind the calculations on this one since it's more lengthy but you can read more about it in my post about Our Current Financial Plan. But after all of our income, expenses and planned savings for the month we ended up with an extra $890.32 in our checking account to use for investing in our future. We have actually made one small change from our previously stated plan and instead on dividing this 50/50 between our mortgage and Vanguard we have begun dividing it evenly 4 ways, adding 2 more buckets for remodels and vacation. So this time we invested $222.58 worth of the mutual fund VGHCX from Vanguard. Next I called up my bank and scheduled a payment for an additional $222.58 to go to the principle on our mortgage. So after our regular mortgage payment that automatically pays on the 1st of each month and this extra payment our mortgage dropped down to $112,777.11 today. Which means that, as of today, we actually own 35.19% (roughly 661 sq. ft.) of our home. We bought 10 sq. ft. this month, that’s almost a whole closet!!! So, by and large our June turned out rather well even though we had that market scare last week. How did things go for you? And here's to having a great July ahead of us. Nice progress! I came over from J. Money's blog. I'm looking forward to reading more of your stuff! Thanks Brian. We're glad to have you join us. Please sign up for our newsletter and I look forward to hearing more you. And thanks for the ideas.